Left to right: Ben Butler, Fletcher Lord III and Crow Lord. Little Rock, Arkansas-based Crow-Burlingame – one of the largest Bumper to Bumper affiliates in the country – has appointed Fletcher Lord III as president of the family owned company that is marking its 100th anniversary this year. Lord, who has served as vice president since 2012, takes over the role of president from Bill Schlatterer, who will continue to serve as CEO for Crow-Burlingame. 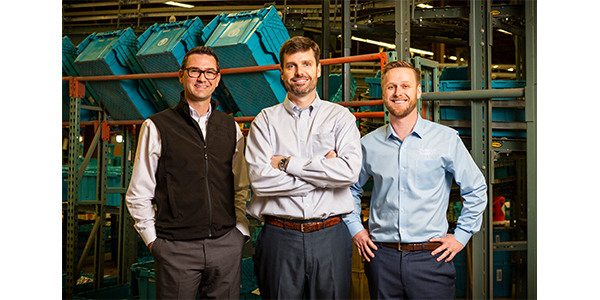 Crow-Burlingame is a leader in the replacement auto parts industry with 177 company-owned stores and three warehouses serving seven states across the South. In addition to the appointment of Fletcher Lord III as president, Senior Purchasing Manager Ben Butler has been named chief operating officer and Crow Lord, currently serving as district manager, has been named vice president regional sales. The company made the leadership announcement at its annual conference in Little Rock for vendors and the company’s 1,250 employees from Arkansas, Louisiana, Missouri, Oklahoma, Texas, Mississippi and Alabama. Lord Jr., who served as president from 1974 to 2012, will continue to serve as board chairman for Crow-Burlingame. In addition to 52 years of service to the company, he also has served in key industry-wide roles throughout his career, including three terms as chairman of the board of the Aftermarket Auto Parts Alliance, a $3.2 billion dollar marketing and buying group, and as chairman of the board for the Automotive Warehouse Distributors Association, the largest industry association representing more than 600 warehouse distributors across the country. In addition to the company’s 177 company-owned locations and 1,250 employees, Crow-Burlingame also serves an additional 160 independently owned Bumper-to-Bumper automotive parts stores. EDITOR’S NOTE:Stay tuned later this week for additional reporting from the Bumper to Bumper/Crow Burlingame business conference and centennial celebration, which took place this past weekend in Little Rock.